Spearville junior quarterback Nathan Stein has delivered two straight terrific seasons for the Royal Lancers. Spearville is 17-2 in ’13-’14, including a 9-0 record and No. 2 ranking in Eight-Man, Division I this fall. Asked what he has improved on the most from sophomore to junior year, Stein gives a unique answer for signal-callers. “I would say my blocking,” he said. Quarterbacks rarely throw blocks at any level, but in Spearville’s single-wing offense, a rare look in the eight-man ranks, Stein sometimes doesn’t take the direct snap. Stein does pass for the Lancers, but speedy sophomore running back Luke Heskamp often receives the snap and follows a wall of blockers that includes Stein. 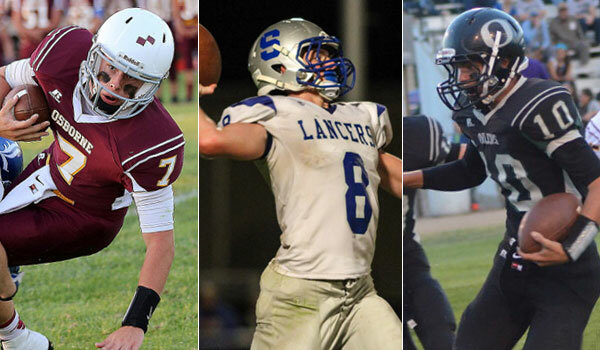 The offense and multiple athletic players has vaulted the Lancers into eight-man’s elite entering the playoffs that open Tuesday. In Eight-Man, Division I especially, the postseason will likely be defined by the quarterbacks. Virtually all of the top teams have a talented, experienced signal caller. But what separates the QBs is their skill set and the offense it runs. Spearville, which owns a neutral site victory against Madison and road wins versus Ness City and Hodgeman County (teams that went 21-3 when not playing the Lancers), is in position for its first trip to a state championship game in school annals. The Lancers play host to Atwood on Tuesday. Stein has thrown for 717 yards on just 73 pass attempts and rushed for 688 on 99 carries. He has accounted for 25 TDs (nine passing, 16 rushing) with just one interception and no lost fumbles all year. Stein has the ability to make big yards out of broken plays, including a zone-read for a score in Week 8 against Hodgeman County. Between his running and passing, Stein has averaged 8.2 yards per play and accounted for a touchdown on 14.5 percent of snaps. His one turnover is the fewest among top Division I quarterbacks, a group that includes Osborne’s Jake Tiernan, Central Plains’ Braedan Crites, Oberlin’s Noah Nelson, Ness City’s Tanner McMillen, Peabody-Burns’ Braxton Kyle and Hanover’s Andrew Bruna. Of the seven quarterbacks, all of them have played at least 15 games under center in their careers. Spearville, Central Plains, Hanover and Peabody-Burns are undefeated, and Osborne, Oberlin are 8-1, while Ness City is 7-2. All seven squads averaged at least 48 points per game. But the QBs are used in different ways. Tiernan has thrown for 1,576 yards and rushed for 426. He has averaged nine yards per play with 29 total scores- 14.4 percent of snaps have resulted in scores. The Peyton Manning of eight-man high school football, Tiernan is 27-4 playing for his dad, Steve. Steve Tiernan built a powerhouse at Baileyville B&B and has now changed the offense at Osborne. Crites has thrown for more than 55 TD passes in the last two seasons in a pass-heavy Central Plains’ offense. Kyle has delivered similar numbers to Stein with 682 passing yards and 789 rushing yards – good for 8.8 yards per play and 17.3 percent of snaps resulting in TDs. Oberlin, which made the 2-1A playoffs last season with three players sharing time under center, has given the reins to Nelson in its run-heavy offense. Nelson’s numbers aren’t as gaudy (894 pass, 223 rush) but he has accounted for 18 scores against just five turnovers. Hanover’s Bruna first started midway through his sophomore year, then started all 2013 and ’14. Hanover finished No. 1 in scoring offense (518 points), while Central Plains was second (488) and Spearville fourth, third among playoff teams (484).